Some of us may only experience it vicariously in the movies but Joe Rice’s life story is a real drama. However, this did not stop him from achieving his goals in life, making him an inspiration to thousands. Listen to this interview as Joe Rice shares his experiences as a child growing up under the wrath of his step-father; his childhood filled with anxiety, fear, hatred, and destitution, offset by the love given by his mother and hope offered by various individuals who come along his way. Joe Rice may not have achieved his dream of becoming a social worker but he has given and gained more as an educator, wanting to reciprocate all the help he had received growing up. Celebrating his first decade as president and CEO of Mid Pacific Institute, Joe Rice has spent 35 years in the teaching industry, changing people’s lives by sharing the life he once lived. Learn more about his thought-provoking and inspirational stories as he narrates his childhood and how he had become a teacher not only in the classroom but also to the community. Joe C. Rice is President and Chief Executive Officer of Mid-Pacific Institute (MPI), an independent, grades kindergarten through twelve (pre-kindergarten effective 2005-2006 school year, 141-year college-preparatory school which is located adjacent to the University of Hawaii at Manoa. 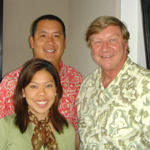 Mr. Rice has been with Mid-Pacific Institute since 1996, and oversees all corporate financial, development, and educational activities. He is a member of its Board of Trustees. Mr. Rice has been in education for thirty-five years with twenty-three years as a principal/educational administrator. He is an educational consultant and university adjunct professor, specializing in learning and reading styles, nongraded and multiage education, and reading methods. In the State of Washington, Mr. Rice was the Principal of Madrona School in Edmonds for twelve years; Principal at Pennisula Elementary School in Moses Lake for two years; and Director of Special Programs at Lutacaga Elementary School in Othello for two years. In the South Pacific, Mr. Rice served for two years as a Special Assistant to the Director of Education, U. S. Trust Territories of the Pacific Islands, where he oversaw the operation of the Personnel Department, Federal funding and grants, and teacher education activities. As Director of Project “Pacific” and State Director of “Right to Read,” Mr. Rice also hired, trained and evaluated project teachers. While in the Peace Corps, he taught high school language arts in Kabul, Afghanistan and in Saipan (Mariana Islands). Mr. Rice graduated from the University of Washington with a Bachelor of Arts degree in Education and a Master of Arts degree from Central Washington University. His Doctoral Studies (continuing) are in the field of brain research and alternative education. Mr. Rice is a member of the Chamber of Commerce of Honolulu, Hawaii Association of Independent Schools (HAIS), National Association of Independent Schools (NAIS), Association of Supervision Curriculum Development, Oahu Country Club, The Plaza Club, Rotary Club of Honolulu Sunrise, Girl Scout Council of Hawaii (Treasurer), and Phi Delta Kappa. Mr. Rice received the Golden Apple Award for Educational Excellence presented by Public Television and Pemco in 1994, the Excellence in Educational Administration Award from Western Washington University in 1993, and the National Golden Acorn Award from the Washington State Parent and Teachers Association in 1988. Mr. Rice is also on the Board of Trustees of Queen’s Health Systems (the parent company of the Queen’s Medical Center, Molokai General Hospital, the Queen Emma Foundation, Hawaii Medical Library, etc) and Foster Family Programs (formerly Friends of Foster Kids/Casey Family Programs). Mr. Rice’s hobbies include reading, golfing, baseball, volleyball, writing, old juke boxes, and surfing (the internet). Mr. Rice is married to Florence Coletta-Rice who is a homemaker, graphic artist, and educator. They have two sons ~ Nathan Joseph and Taylor Michael, two grown daughters on the mainland ~ Emily Joy and Christa Marie, and two grandsons.